This listing is for a Beautiful Westmorland Latice Doric pattern Footed 3 stem Compote and candleholders set. The Compote stands 7 1/4 inches tall and is 11 inches across the upper rim and at the tips of the lattice pattern is dark white tips. 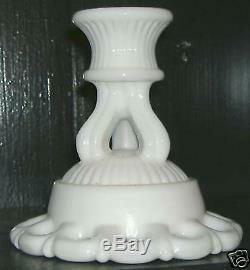 Each of the 4 matching candle-holders measure 4 1/2 inches tall by 4 1/4 inches across the bottom rims. All 5 pieces have a 3 stem footed base. All 5 pieces are in super condition with no chips, cracks, discoloration or other imperfections. For this reason, and the fact that many of my items are 50+ years old, my items show ware and other issues from age and use. They are not NEW or unused unless specified to be so. Look very carefully at the pictures. I also cannot verify that any given item did or did not come from a Smoke or Pet Free home. I try very hard to package as carefully as possible all of the items I sell. However, sometimes, no matter how well an item is packaged, it ends up lost or damaged. 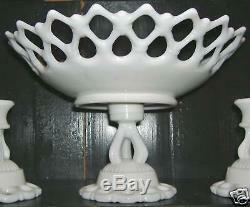 The item "5pc Vintage Westmoreland Lattice White milk Glass Compote Candle Holder Set" is in sale since Saturday, February 20, 2010. This item is in the category "Pottery & Glass\Glass\Glassware\Elegant\Westmoreland\Other Westmoreland Glassware". The seller is "janet94" and is located in La Crosse, Wisconsin. This item can be shipped to United States.